First, go to your Yondo Dashboard and select "Live 1-to1", on the left side navigation bar. Click "Add 1-to-1 session", in the middle of the page. Next, enter your session's title - The name of the session can give customers a brief explanation of what the listing offers. Select a team member who will run the sessions. Select the category - This is used to categorise a session and improve your Google ranking. Upload an image (Minimum upload size: 580 x 435 pixels.). Select the duration of a session for this listing. Select the connection type - There are 4 connection types to select from. This will be the method of communication between your team member and a customer. Video Call is a live webcam chat from inside your web browser. Dial-In has both participants dial a telephone number in their Country, then the lines are connected similar to a teleconference. Direct Contact is where you call the customer directly using their phone number. In-Office is where you will add your office address and phone number so that your customer can come to you for a face to face meeting. Enter a description - The Description is displayed on your listing's page. It helps customers understand what the listing offers and covers. Enter Prerequisites (Optional) - Prerequisites are something that may be required in before a customer purchases your session. Prerequisite’s can be another listing you offer or a specific skill. Edit Portfolio items (Optional) - The portfolio essentially represents your achievements, associated with your listing; and it can be helpful to attract more customers. 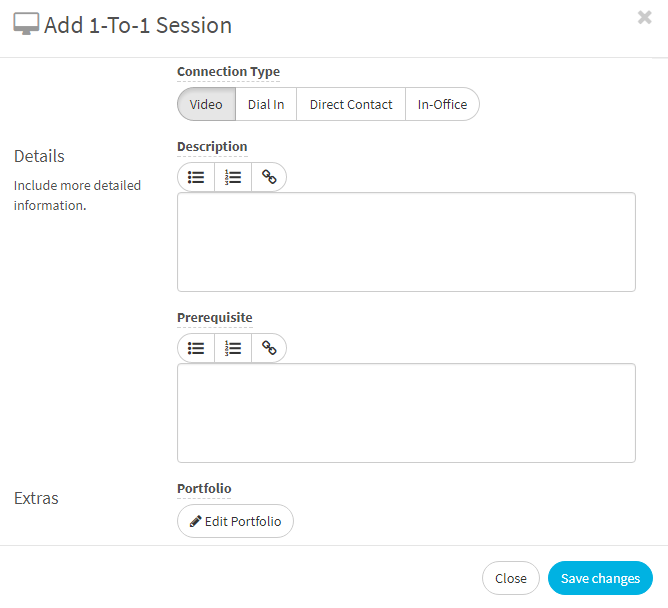 The portfolio is displayed on your session page. Edit Materials (Optional) - You may provide materials associated to your listing such as a PDF, Word documents or images to assist customers during their live session. Your customers can download your materials after they have booked your session. Publish. - If you toggle the switch to "Published" publish, the listing will be shown to the public. Once you're done, click the "Save changes" button at the bottom right corner of the page. To view a listing visit your store by clicking the link at the top left of the Store Management Interface. Your 1-to-1 Listing will be displayed on your Yondo store, under the Live 1-to-1 Section. How do my customers join a meeting? How does a customer access the session materials?